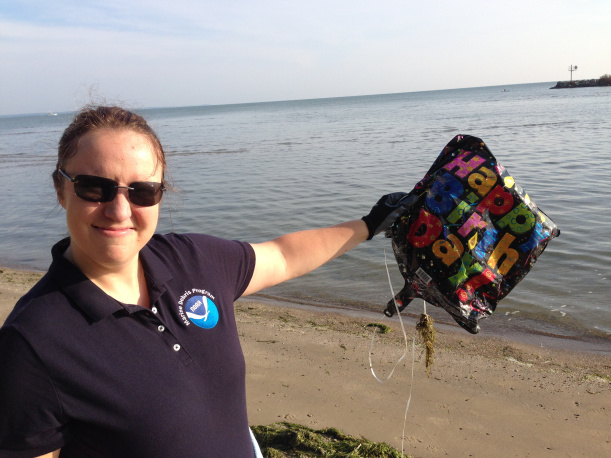 Balloons are a type of marine debris that many people don’t think about. Often used for celebrations or to commemorate special events, balloons are frequently intentionally or accidentally released into the environment. Unfortunately, once they go up, they must also come down; balloons that are released into the air don’t just go away, they either get snagged on something such as tree branches or electrical wires, deflate and make their way back down, or rise until they pop and fall back to Earth where they can create a lot of problems. Balloon debris can be ingested by animals, many of which easily mistake it for real food, and can entangle wildlife, especially balloons with attached ribbons. 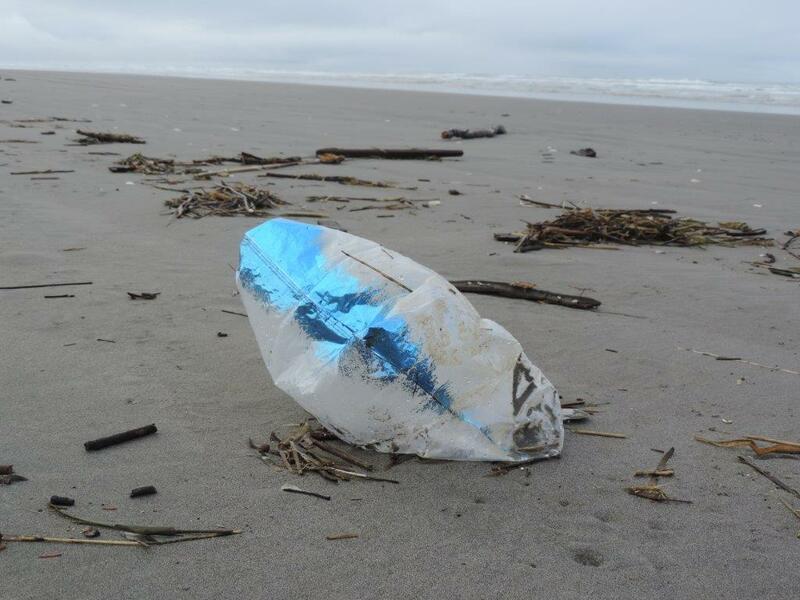 Balloon debris can even have an economic impact on communities, contributing to dirty beaches which drive away tourists, or causing power outages from mylar balloons covered in metallic paint and their ribbons tangling in power lines. Balloon debris is a national issue and unfortunately, the Mid-Atlantic is not immune. Over a period of five years (2010-2014), 4,916 pieces of balloon litter were found in Virginia by volunteers participating in the International Coastal Cleanup, with over 3,000 of those pieces found on ocean beaches. In 2014, 236 volunteers found over 900 balloons in the Chincoteague National Wildlife Refuge in Virginia in a three-hour period. 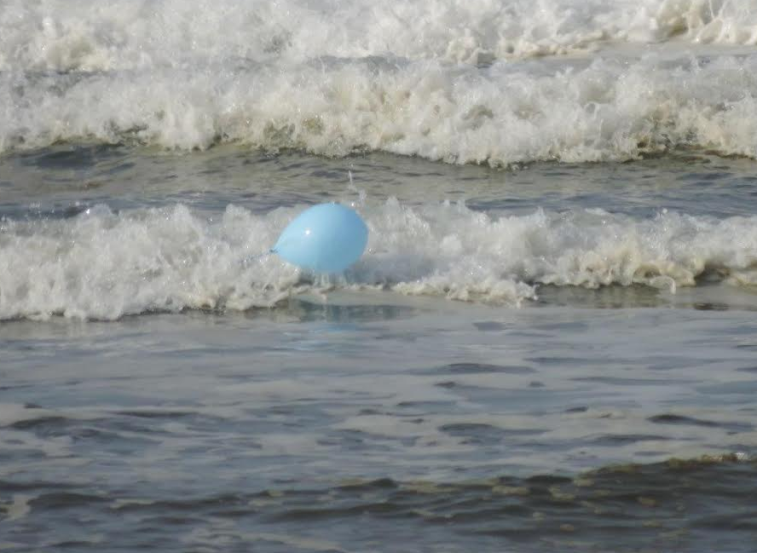 Recent surveys of remote islands on Virginia’s Eastern Shore documented up to 40 balloons per mile of beach. These statistics suggest that this Mid-Atlantic area is appropriate to research the balloon debris issue and to create an education and outreach program that could then be used in other states. So the Virginia Coastal Zone Management Program, with funding support from the NOAA Marine Debris Program, is doing just that. They’re exploring the issue of intentionally-released balloons and targeting that behavior through a social marketing campaign. So what can you do to help reduce balloon debris in the Mid-Atlantic and throughout the country? Consider using alternate decorations at your next celebration such as paper streamers or fabric flags. Rather than giving your child a helium balloon on a string, fill it with air and attach it to a stick—they still get the feeling of it floating above their heads without the risk of losing it into the environment. Most importantly, don’t intentionally release balloons into the air. With increased awareness about the issue, we can all work to reduce this very preventable form of marine debris in the Mid-Atlantic and beyond. 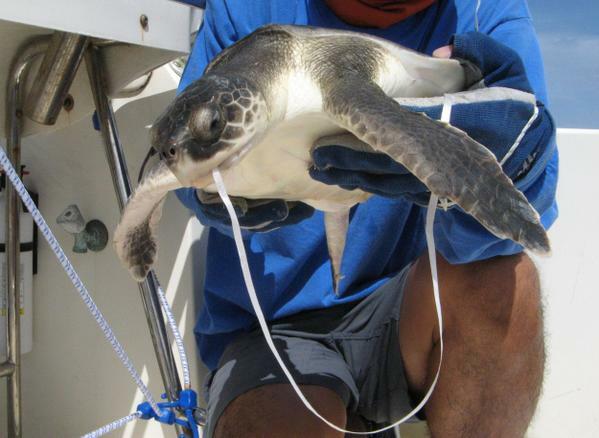 When giving a balloon on a ribbon or string - always make sure that there is a weight attached - educating people and businesses to do this is a major key to preventing sea creatures from becoming entangled. Never release a foil balloon into the sky and never release a latex balloon that has any type of attachment - string or ribbon. Educating people and businesses about these simple tips - in my opinion - are the first and most important steps to take.